"Piping hot loaves of pineapple-zucchini deliciousness! Who could ask for more?" Beat eggs, oil, sugar, and vanilla together until thick. Stir zucchini, pineapple, flour, soda, salt, baking powder, spices, raisins, and walnuts into the egg mixture; blend well. Pour batter into two 9x5 inch greased loaf pans. Bake in preheated oven for 1 hour, or until a toothpick inserted into the center of the cake comes out clean. Cool in the pan for 10 minutes then turn out onto a wire rack. It was very moist, but the pineapple pieces seemed a little too weird to me once it was finished. 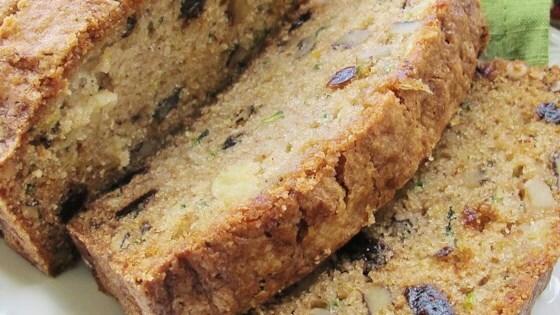 I've been making this pineapple zucchini bread for over 30 years. It's the best, easy to make, and freezes well. I made this recipe in it's original form as an entry in our local fair and it won first place. Thanks for sharing the recipe. This recipe was a hit at my office. I did add some chopped pecans, golden raisins, and a little bit of coconut.